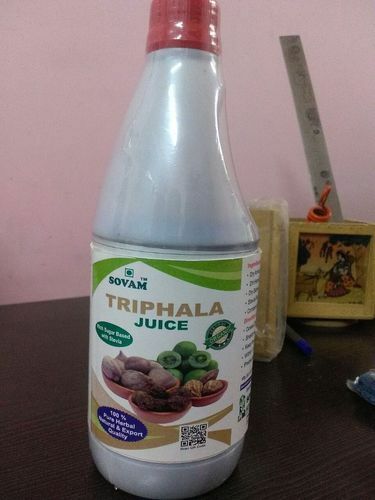 Organic Sunrise Natural Triphala Ras. Triphlla Amla Juice Promets Gastrointestinal Mobility. One of the biggest ampacts of triphalla is its benefits related to digestion. 20-30 ml twice daily for adults. 5-10 ml twice daily for children. Consume within 1 month from the opening og the lid. We are offering a quality assured collection of Herbal Triphala Juice that helps for the eyes and keeps them sharp and healthy. These products are offered to our customers within the stipulated time period with the help of our wide distribution network. In addition to this, the offered product is inspected on parameters of quality to ensure its effectiveness and quality. Triphlla Ayurvedice Medicine Promets Gastrointestinal Mobility. Ayurveda Triphala juicePromets Gastrointestinal Mobility.